This pub sadly is now closed. I remember back in the 80s when it was a genuine local. I expect like so many it's reached the end of its days. Shame. I also remember the beanos that they went on. My dad would have bean there too. Tough not on this occasion. I remember many a happy night sitting on the step outside waiting for my dad, with an arrowroot biscuit and a glass of lemonade. My Grandad was Sid Maskell. He was born 1911, so I think this must be sometime in the 1930's-40. I know my grandad used to go in this pub. Vic as he was known, Hetherington. My dad is Tony Hetherington. Colin and Dickie Hetherington are my dad's brothers. Does anyone remember them? 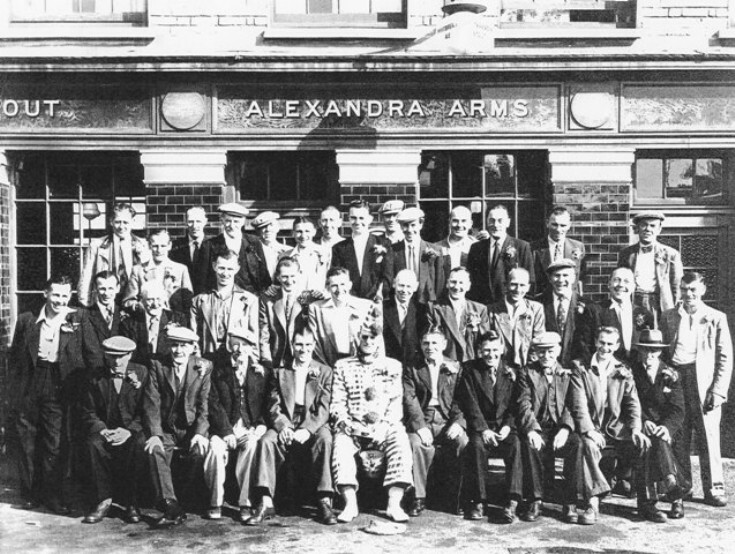 Not sure but think 2nd row from top 1st on left is my mums dad Bill Joyes, and 3rd row 3rd left is my granddad Vic Hetherington. I remember your Mum and Dad playing the piano, Peter. You lived over the road to me and you knew my cousins Susan and Janis Palmer. Your brother Alfie used to play in goal for the Freehold FC with my Dad Teddy Howard. I think fifth from the right middle row is my dads cousin Ernie Ford. My dad used to go on these beanos with his dad Blossom Dorman. That looks like my great grandad in the clown costume 'Jock Brown'. I didn't know him, but heard many stories growing up. He used go round to most of the pubs in the area, sometimes singing, sometimes with his one man band act, Jake the Pake, Foo man Choo, he'd even do his Popeye impersonation, (I'll try to find a picture). He used to have a walking stick he called Joey, and at the pub he would tell the audience Joey was thirsty, and would someone buy Joey the walking stick a pint? When somebody would buy Joey a lager, Jock would pour the beer down the stick's mouth, the top of the stick had a face with a hole drilled in the mouth of it... Now, supposedly, (and I don't quite believe this to be the way it worked...But) there was a hole he had drilled into the the floorboards that he would place Joey right on top of, the beer would go into the mouth of the stick, and all the way down through the floor, and into a barrel below that Jock would drink later... More likely it was just one of those canes that had a hidden flask, he probably added a little head or something, because I just heard that Joey used to wear different hats as well, a jesters hat with bells mostly... You get the picture. Anyway, that was my great grandad, Jock Brown, my nans father. Bit scary if you ask me...My nan was Lil Brown who later married my grandad Jack Fairchild, who later had my dad John, who later had me...(my mum did, not my dad)... Nadia Fairchild.